This is one of our favourite appetisers.....Asparagus with prosciutto and blue cheese. Asparagus with prosciutto and blue cheese. 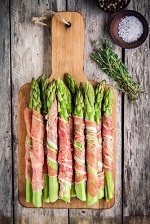 First place the prosciutto on your worktop or plate, put a dollop(teaspoon) of blue cheese on each piece and wrap it round the middle of the asparagus'. Preheat a barbecue grill or chargrill pan on high and spray the asparagus lightly with olive oil. Cook on the grill, turning occasionally for 3-4 minutes or until the prosciutto is golden and the asparagus is tender and crisp. Transfer to a serving platter to serve. Our Red Signature Chardonnay will go perfectly with this and so will the Red Signature Shiraz, because of the blue cheese, if you only drink Red. Or otherwise drink our Shiraz with any main meal of your choice; a good steak, roast beef, ribs, spicy sausages, any smoked foods in particular. Big beefy stews such as ox cheek especially cooked in the wine or with a touch of smoky paprika is lovely. You can find our Chardonnay and Shiraz at Co-op.